Please join us for a reading by the poets and writers of Crab Creek Review, as we celebrate the publication of both our Fall 2017 and Spring 2018 issues with a release party at Couth Buzzard Books! 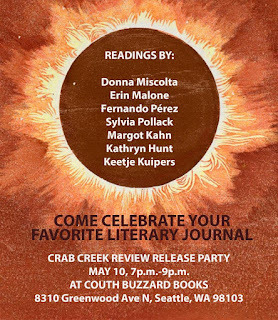 We are excited to feature Seattle writers Donna Miscolta, Erin Malone, Keetje Kuipers, Sylvia Pollack, Margot Kahn, Fernando Pérez, and Kathryn Hunt. The Couth Buzzard serves beer, wine, espresso, & has a tasty little menu (the pear & gorgonzola pizza is mouthwatering!). Plus they have books! Pick up the new issue of Crab Creek Review, or browse the great selection of new and used. It's sure to be a great evening, & we'd love to have your company.